I received the loveliest card from one of my blogging friends, Connie, who blogs over at Connie's Crafty Creations. I admire her beautiful handcrafted cards that she shares on her blog and I wish that I had more time to develop my own skills in card making. Connie makes it all look so easy and I do love playing with paper just as much as I love playing with fabric! So perhaps someday!!!! Anyways, is't this the prettiest card? 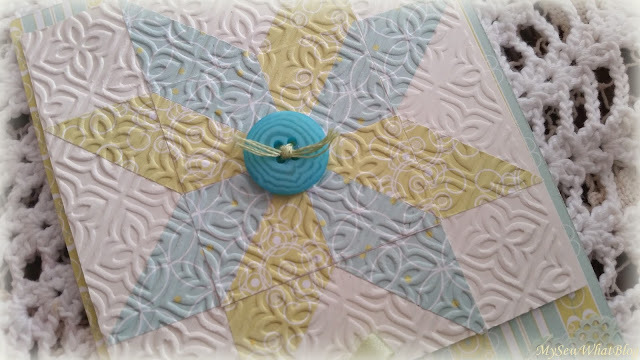 It looks just like a quilt square, carefully pieced using paper instead of cloth. Here is a close up of some of the detail! 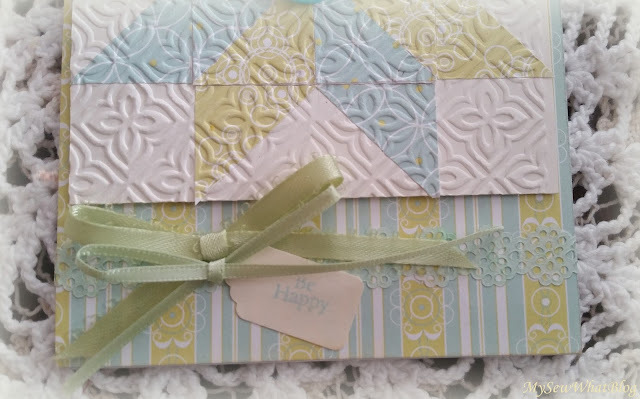 Note the pieced paper quilt, the sweet ribbon bows, the lacy horizontal strip and the little tag that says be happy.....the colors are so tranquil...I love the color combination. 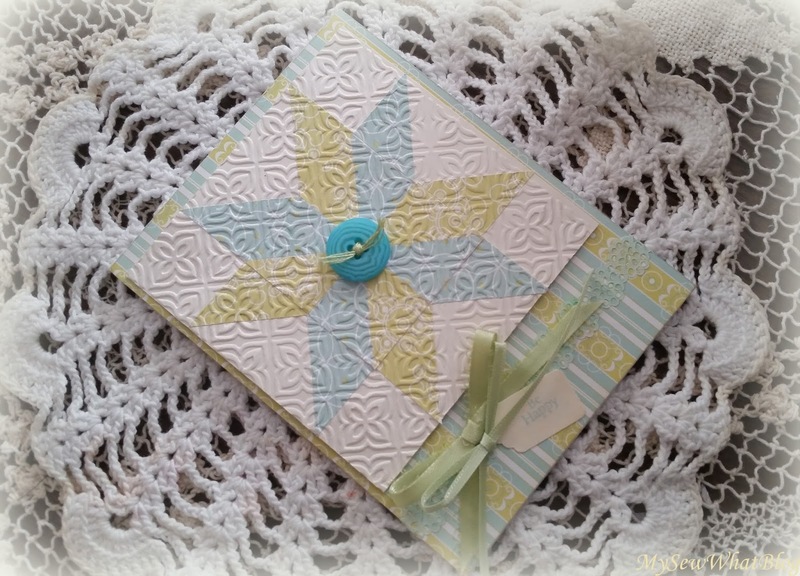 When you stand it up, there's even more detail on the very bottom of the card and some sweet little flowers! To think that she created this little gem just for me-- well, let's just say it does my heart good! There is nothing more special than receiving a handcrafted gift from a friend. I am so touched and grateful! Thank you Connie for your friendship and your constant flow of encouraging words! If I've said it once, I've said it a thousand times, BLOGGING FRIENDS ARE THE BEST! 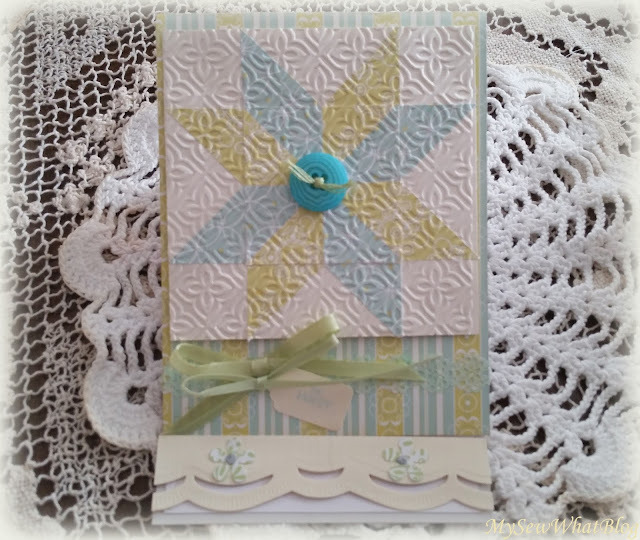 If you haven't visited Connie's blog you must stop by and check out some of her beautiful cards. The link to her blog is at the beginning of this post!